Trust you all had a super time this last weekend with family and friends celebrating this crazy time of the year. Trust your dinners or lunches went off without any hitches and nothing was left in the oven not having made it to the table. This year with our 3 little ones for the first time as a trio it was a little different. We had running commentary from JM; “its this many sleeps to Christmas and I want this and that for Christmas” and JM would then announce what CG would want for Christmas and poor TJ was a little oblivious to it all, much like both JM and CG last year. It’s really crazy when one thinks how things change in a year. I mean JM really knew about Santa this year and what he does and how he does it, we as parents didn’t really discuss it and found it crazy how all of a sudden we had to start discussing all this stuff with a 3 year old. It is amazing the level of influence in a little person’s life from her school, yes I know this is all part of her growing up and then on the other hand knowing we can’t wrap JM in cotton wool for the rest of her life. This did spark the great debate amongst mom and dad aka myself and KM, what do we tell JM, do we tell her it’s a myth or do we play along with the fantasy of some big rather dad looking like character coming down a chimney to deliver presents if one has been good for the year beforehand. How do we begin to explain that chimneys are not part of the modern British home? Then resorting to more fantasy about a magic key. Anyway this debate did cause a stir among the lawmakers of the Botha Household. Obviously as you have probably figured out, it was 1 vs. 1 to begin. In the end I agreed that it was too late, two weeks before Christmas to start the discussion after already playing along with the story about the red fat man. Needless to say the mince pie and Baileys was put out along with some reindeer food! We made sure that the fat red man was countered with the real reason for Christmas, why do we celebrate and what we celebrate, etc. Yes we celebrate the fact that Jesus was born in a stable and that He had gifts brought to him, much like gifts are brought to us in a sense. Never the less we had a great nativity calendar up, made by my super crafty wife and in each of the days were animals or people who attended that rather famous night Bethlehem. For the record, in our story it was noted that we had Bunny rabbits attending, together with chickens… Ok I know its not Easter yet, but a major shop aka Tesco’s were selling Easter eggs before Christmas… What is this world coming to? To go back on the whole celebration and birthday of Christmas, our little monkeys will be forever confused about this celebration as we did also wish KM’s mom with a birthday cake and all. So I guess we did sing Happy birthday for two reasons on the 25th. 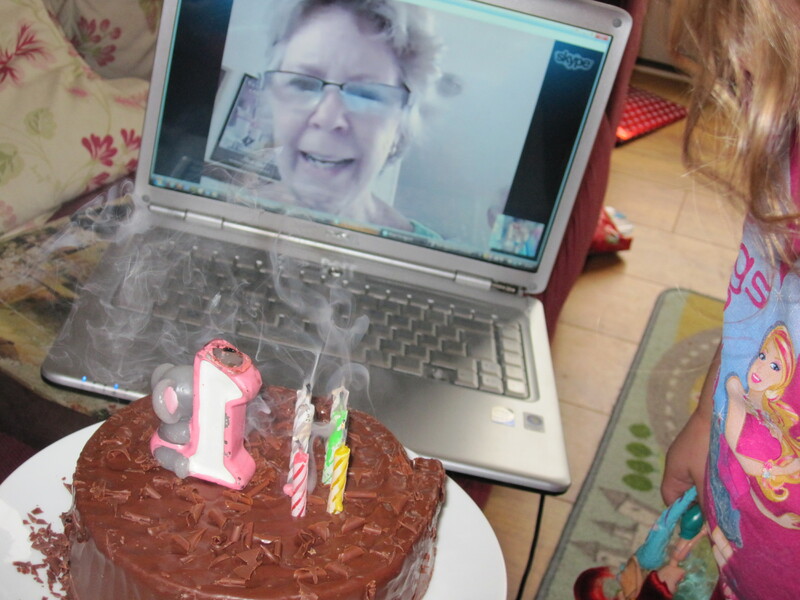 Equipped with cake we sang the tune via skype to a happy Dodo in PE. So those of you out there thinking that explaining this Christmas thing is a piece of cake, spare a thought for those of us trying to explain that their granny shares a birthday with one if not the most influential man that ever walked on this planet. Back to our celebrations, we did the whole Christmas lunch thing on Boxing day to allow us to celebrate with my mom, gran and Paul, who might I add every year do the noble thing and give meals out on Christmas day to those who are lonely through the Salvation Army. It was great to spend Boxing Day with my gran and our little ones gran-gran. Thanks to my mom and Paul for the drive there and back for this occasion to happen. Needless to say our bellies were full with the normal gammon, beef, brussell sprouts, parsnips, etc. Don’t mention the Yorkshire puddings which stayed in the freezer or the little present boxes with post lunch sweets inside which stayed on top of the fridge. It was great and only a day ago did we finish the leftovers…. probably the best part of Christmas dinner…the leftovers. We did however do a very normal South African thing on Christmas day, we braai’d. Yes we had Lee and Dave with us and did steak, boerewors, chicken etc on the braai with salad, all done in 13 deg weather. Believe it or not, the hottest Christmas day temp in Britain for some 20 years. From the present point of view, it was super cool to see the expressions on JM’s face and even that of the speed man of present opening… Mr CG himself. So much so that we had to rewrap Gran-gran’s present twice before it was given to the rightful owner a day later. 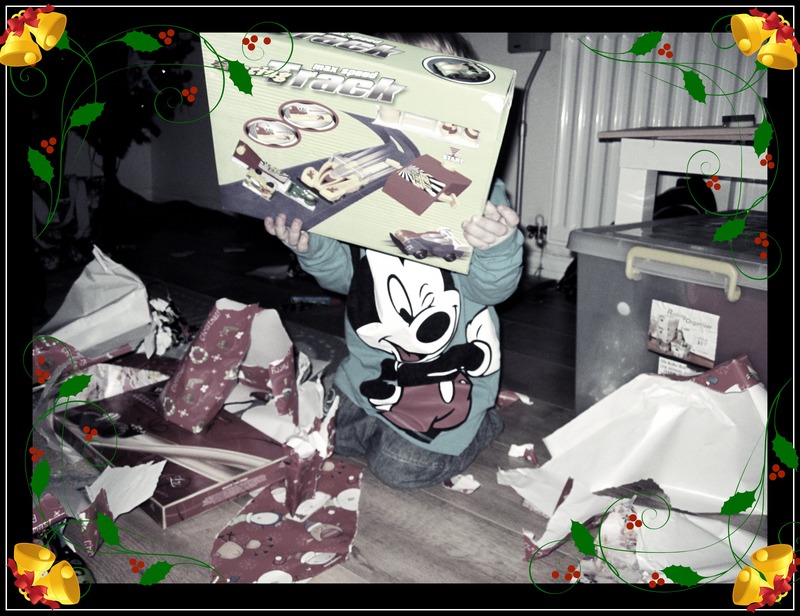 I must say on the one hand it is nicer to have little ones to see them open their presents and be happy with them then on the other hand not having little ones and opening all ‘your’ presents. One of the little trips we did recently was going into London where we experienced the Winter Wonderland in Hyde Park. Even though it took us 2.5hrs to do a 30min trip we still had a great time in the cold. It was great to walk around and thank goodness we had a double buggy, which acted as a battering ram as there were hordes and hordes of people. It was great to see the many lights on all the fairground rides, the ice rink, and the little Santa’s grotto. 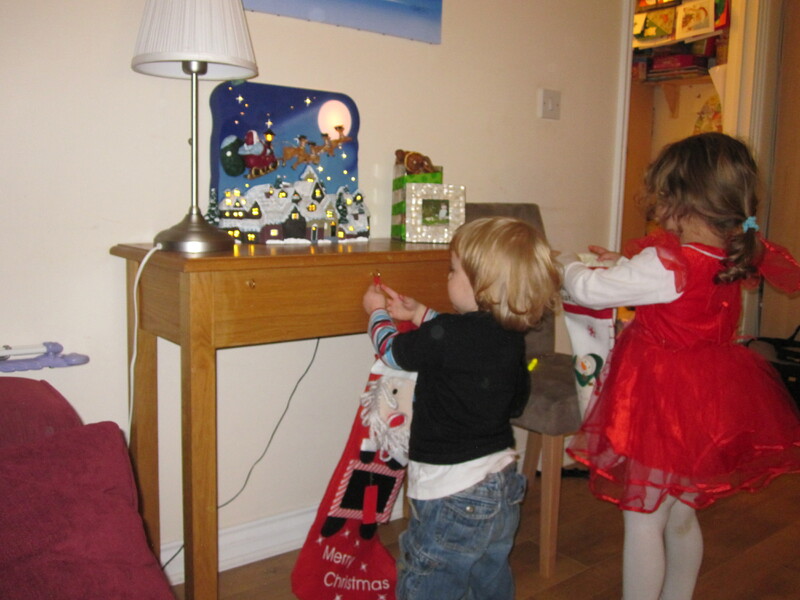 They also enjoyed the singing chickens and the talking tree was a big hit. It was great fun even though we spent more on the car parking in London then we did during the 3 hours at the Wonderland. Only for a friend to tell us afterwards that if we were to walk 5 minutes away it would have been free parking…note to self: Do more research before doing the London thing. So what else have we been doing, Church is going great and still growing in the right direction. 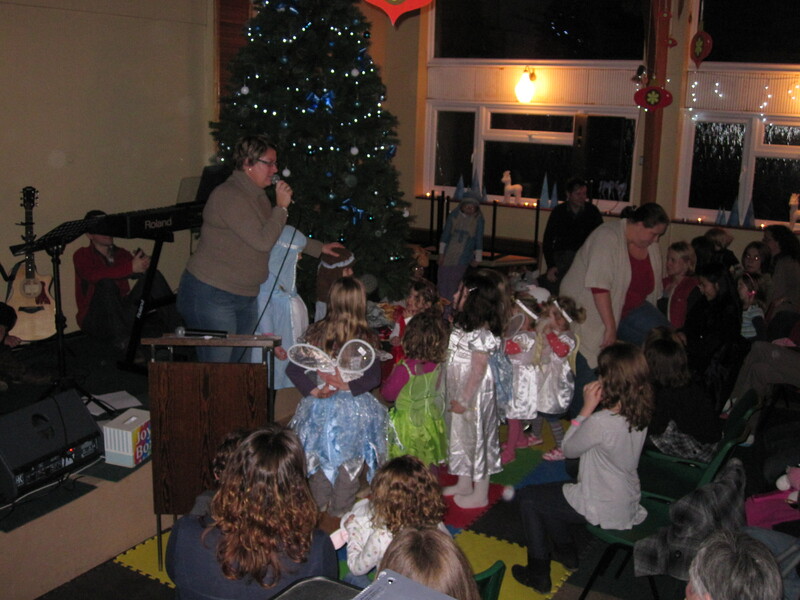 We had over 100 people come to our Christingle Service which was super as well as we were blessed with tickets to our churches first Winter Ball with live band and great food too. It was great to boogie the night away with friends. Last but not least is to mention that our boy is now a BIG boy, he is sleeping in his big boy bed as noted by his sister JM. She is still keen to tell us in no uncertain terms that she is still the oldest even though CG is now a big boy is his big boy bed. Well I guess that’s it for another month, I’ll do another one of these next year, sounds a long time away. Have a super time this next weekend in what ever you choose to celebrate the dawning of 2012. 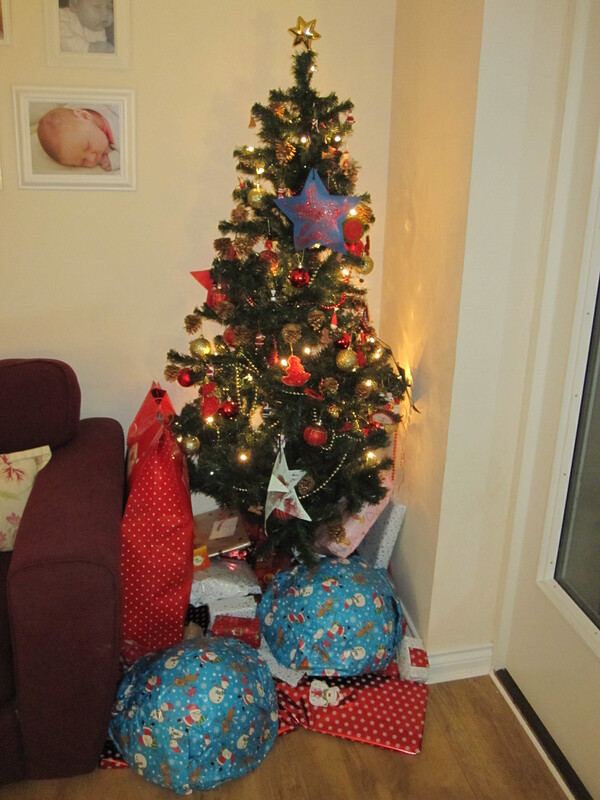 We’ve had a lovely Christmas, good food, bubbles, family, laughter, love and gifts! Afternoon naps and someone falling asleep on the couch, left overs and the smell of mulled wine and christmas pudding! I hope yours has been as good! Here’s our in pictures! Getting into the holiday spirit with a nativity christingle Explore service! Bailey’s and a mince-pie for Santa! 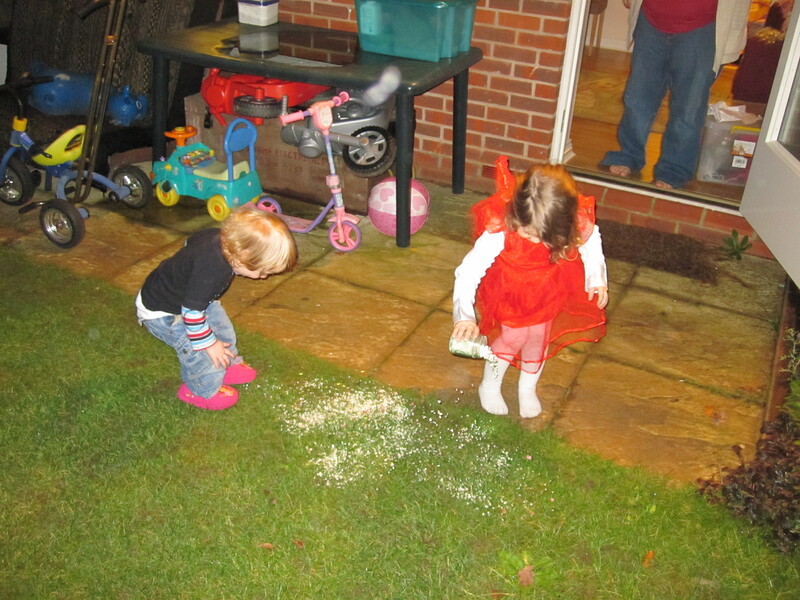 Reindeer food, and my son in pink Dora slippers! Hence my daughter is in none! Guess the fat guy came after all! It’s not just Jesus’ birthday on the 25th it’s also Dodo’s!!! 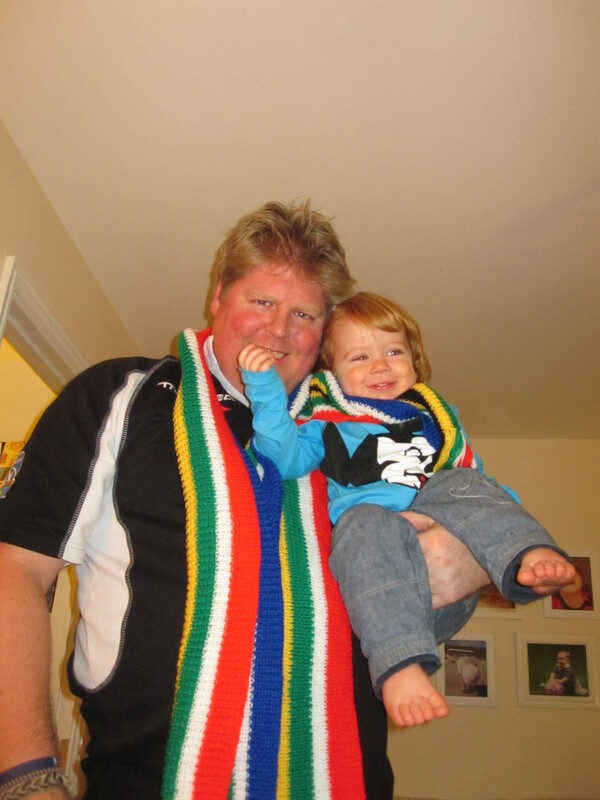 Home made Bokke scarfs from Dodo! How many hats does one girl need. A season spirit snap slap. As usual 2 photo’s I’ve played with… 1 is never enough! See some more slappers over on fivegoblogging! And as an added bonus here is the one I was playing with earlier from Christmas day! My 2 gorgeous girls having a cuddle and giggle! A blessed time of year! Christmas truly is a time for family, friends and faith and it’s around this time every year I start thinking about how incredibly lucky we are have all 3 of those. Every year I wish we were closer to family and friends we love but I can’t remember once thinking I wish I had more faith at this time of the year! It’s a time that inspires faith! It’s a time that makes us remember what makes our/my chosen religion is so special and a time to remind ourselves of why we believe and how we came to that decision! The inspirational story of a brave young lady, pregnant whilst still a virgin; of a stand up young man who decided to stick with his lady even though her story made no sense and people would have judged him unfairly. Of a special baby born and laid in a manger. Visits from angels, magi and special, magical stars that guided the way. It’s a story soo unbelievable it’s got to be true. It’s a story the whole world celebrates – whether or not they believe, it’s a symbol of hope and peace in a world that so badly needs it! So lets celebrate this year with love, peace, thanksgiving, family, friends and faith! May the magic of christmas touch each and every one of you! I think Jenna’s prayer tonight so brilliantly sums it all up: “Thank you for Christmas, thank you for reindeer food and Santa. And thank you for Jesus Christ so we can all live for always”. Out of the mouth’s of babes!! God bless and Merry Christmas to you and your family! Just a little something to add to top up the Christmas spirit – it just isn’t christmas without a little Boney M!! The whole commercial Christmas thing really gets me a bit wound up. 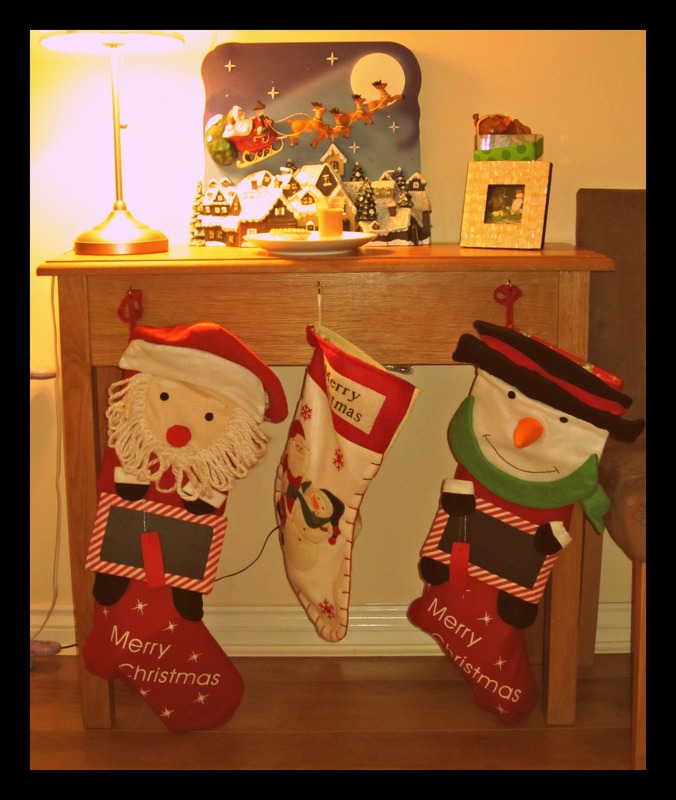 Now I love Christmas and have nothing against starting a little early but the whole reason behind Christmas just seems to get lost in the manic rush to spend money on stuff! A lot of stuff that a lot of people probably won’t even use again! With my kids growing up in gift mania that seems to be Christmas now a days I’m trying to find ways to make it mean that little bit more cause if Jenna had her way it would all be about the presents! Christmas is after all a religious festival about the birth of our Saviour and as such needs to (in my house anyway) revolve around that! 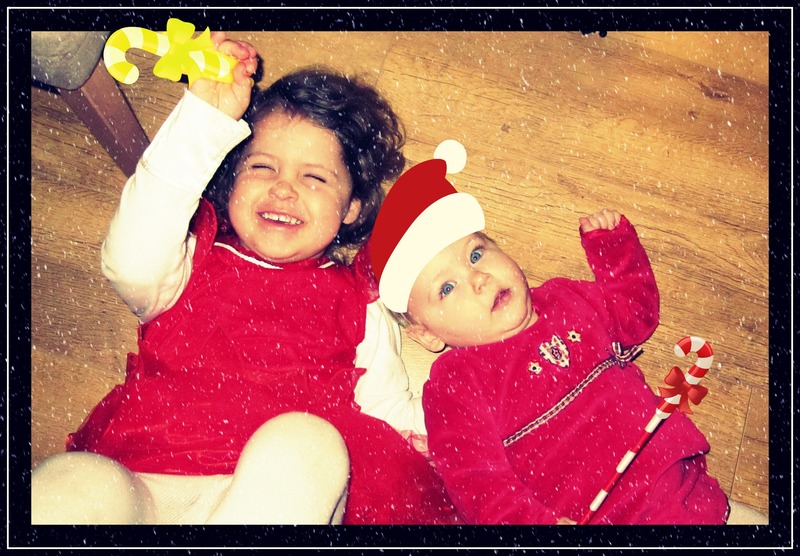 But regardless of whether you believe or not Christmas is a time for family, love and giving – not only of gifts either! Today the children, my mom and I are going to go through all the kids toys and they need to select 2-3 toys that they don’t use all that often and they think other children will like to give to the local children’s charity shop. 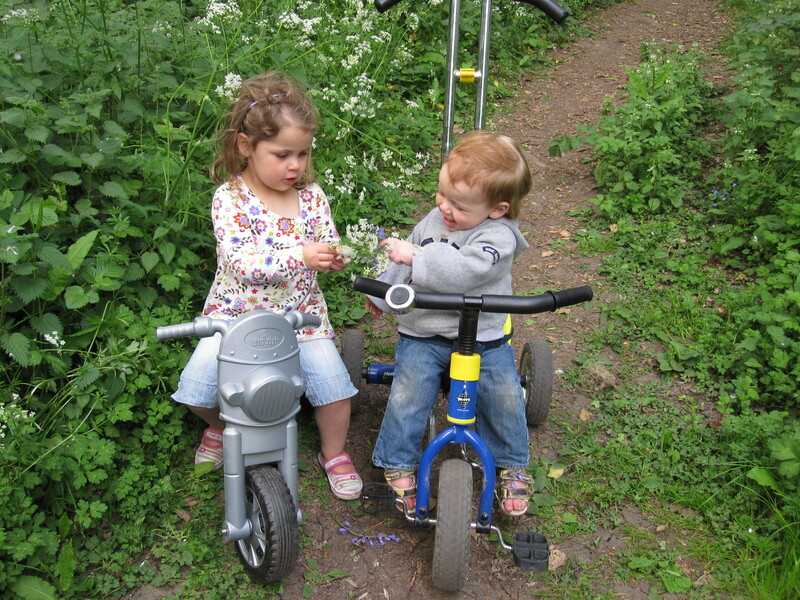 They also collected some money on a walk with the child minder to use towards giving a “Good gift“. 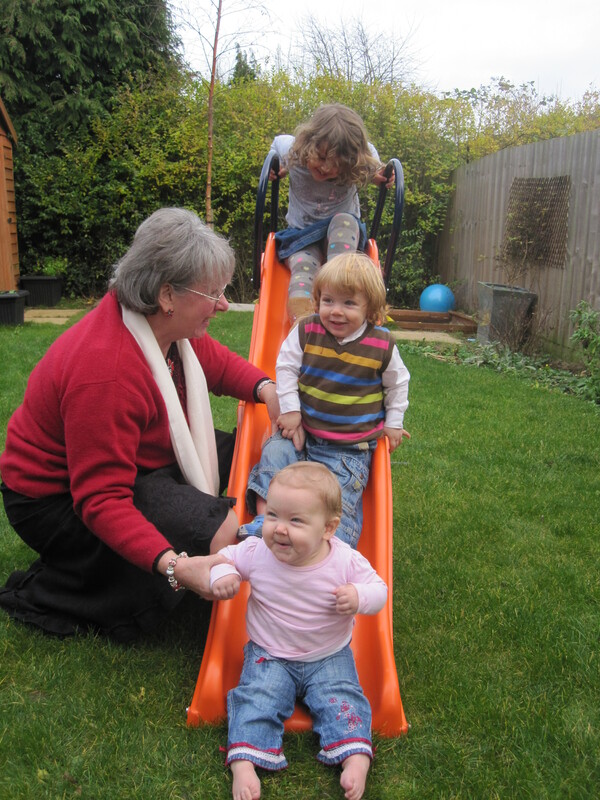 The child minder has also put the money she would have spent buying each of the children gifts towards this fund and together all the children will decide what to donate their money towards. I’d love to give some other little gifts for the kids to share with others. Things like taking a big bag of home-baked Christmas cookies to the old age home around the corner or doing some other good deed; cleaning or sweeping someones icy walk way (maybe we’ll get hubby to do that!). Let’s make this a season for giving and not just receiving… anyone else got good ideas of gifts to give?? I’ve obviously been walking around blind for the last two months or my ‘usual’ observant self has failed hopelessly. Last night was a super cool surprise 30th birthday party thrown by my lovely sneaky lady. It has been truly crazy time at work recently and I can only think that I’ve been too distracted not to notice the crazy things that have been happening. Where do I start to explain all the crazy little white lies that have been told to me in the last couple of months, while Kerry has been planning this party without me knowing a thing. I didn’t have a cooking clue what was going on behind me… in theory. The ‘story’ was…Kerry says: “we are going out for dinner, don’t worry my sister has paid for it, so it wont come out of our non-existent budget for eating out…our reservation is for 8:15pm at a restaurant in Rickmansworth but first we need to go via the church to help Dave put up some Christmas lights up”…that was the rouse. I didn’t think anything of it. Even approaching the church and seeing some of the lads from church cars parked outside nothing clicked. Even going through the door and seeing a table full of ‘booze’, still the brain was still only thinking ‘we’re only going to be here for about 10/15min and then we going to dinner to have a quiet evening. When suddenly… I heard about 40/50 of my friends and family shout SURPRISE… All I could do was turn around to my lovely wife and sob on her shoulder and blubbering something along the lines of…How? Why? And then… Thank you… Thank you. Needless to say I manned up after that and enjoyed my first surprise party organised brilliantly behind my back. It will certainly never be forgotten and heaven forbid I don’t think my ticker can go through that jolt again. There are so many little things I said along the way that Kerry thought I knew what was cooking. Even to the point that while we were travelling last night to the church ‘before we went out’ I said to Kerry…’you don’t really hide things very well do you?’ Kerry thought I’d had known for a while and was about to tell her I knew, but I was talking about the shopping bag left on our bed which had receipts in for the shoes she had bought me with my vouchers. Needless to say Kerry’s secret was still intact, even minutes before the actual event. Yesterday morning we had a difference of opinion, which ended in tears and tension, about whom Kerry had chosen to baby-sit our 3 little ones while went go out for ‘dinner’. I couldn’t understand how none of our family that we have around us or even close friends would have volunteered to help us out. I said things that have bitten me of the bum like…’she doesn’t have a compassionate bone in her body’, needless to say I felt terrible after knowing that there was a clear reason why no one would baby sit for us due to the fact that they were all waiting at the party. And one of the cherries on the top was finishing work late at 5:45pm and then getting a phone call to go and pick up our babysitter due to the fact that Kerry couldn’t leave the children by themselves… all part of the plan, I now know. There are so many other little things that one could mention of how my super sneaky wife planned everything, like hording small amounts of cash (which actually I found a couple of months back, then I hid it and almost scuppered her plans which were the in the infancy and all I got told was ‘trust me!’, just ‘trust me!’). Saving up to purchase things for the party to even storing it at the neighbour’s house while they were away so I wouldn’t notice all the goodies. And the strict budget that we are working on now a day was not affected thanks to Mr. Sainsbury’s and Nectar points which can be used to purchase groceries. Kerry in theory had to use an alternative method of paying due to that me being the Bank Manager at home and at work and having the ability to know when Kerry has shopped and where and how much as been spent, so much so that a few months ago I phoned her to check a transaction which only happen in the last 30mins. I know that may sound like I don’t trust my wife’s spending ability, but when one is watching every penny…. anyway enough said on that. Anyway after a crazy night last to a crazy couple of days ahead, I turn 30 and then Kerry’s turns 31 years of age. 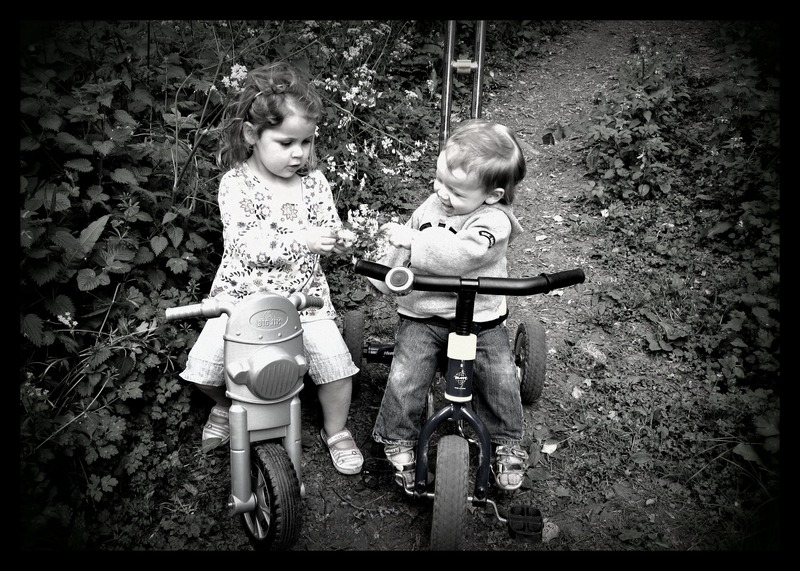 We have both turned the corner, into our 30’s and have our 3 little kiddies. Well I guess after all that went above, anything else I write wont really live up to it, all I can say I have new appreciation for my wife and even though she will admit that her romantic side is not the strongest, I think this gesture that she pulled off more than makes up for it. Other news is that we have enjoyed having Dodo with us for the last couple of weeks. Kerry’s mom; Sharon has been with the kiddies and us. It has been great to have the extra pair of hands around and don’t tell my wife but I know where Kerry gets the cooking from…its her mom that’s for sure. We have been eating well…. enough said. 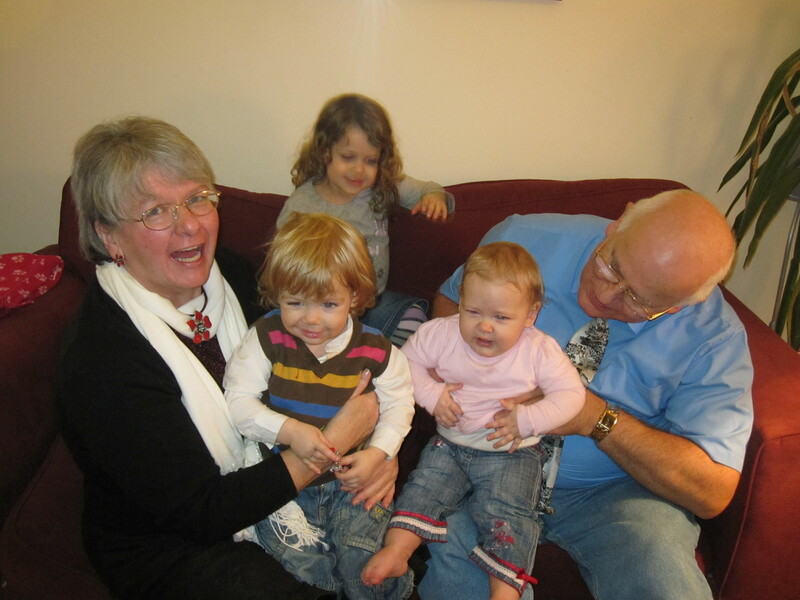 Another significant event happened in the Botha household a couple of weekends ago, we had 3 grannies in one house. Yes Granny Trish, my step-mom was over from PE after coming over for her boy’s graduation and spending the Saturday with us, my mom popped around and we had Sharon with us too. 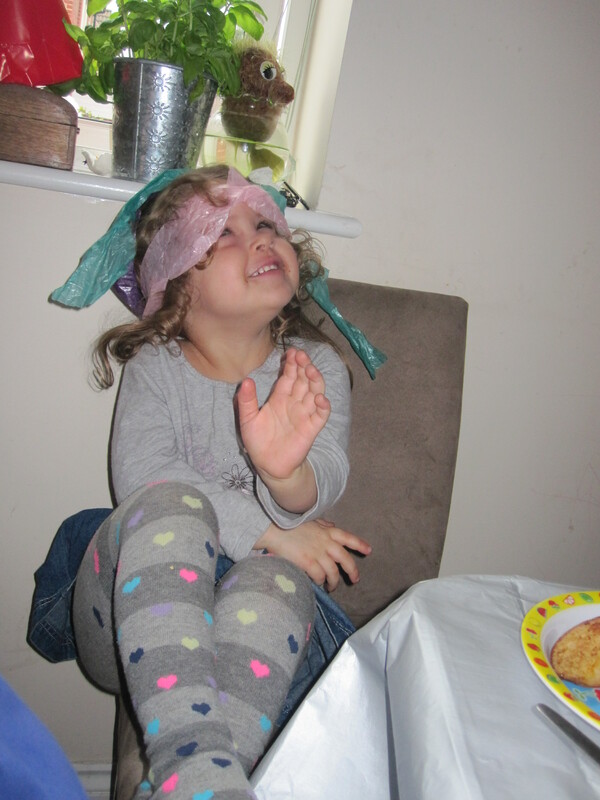 Needless to say that our 3 little ones were beside themselves, having all the wrinklies in one house…hee hee. Don’t tell them I said that! It was great to catch up with Trish and her brother Bernard who also joined her. They spent the night here Saturday en route to Coventry where my step-bros stay and they were doing that funny hat and gown thing. Huge congratulations to them for completing their degrees and wish them well in their careers. Quick update on our little 3… Jenna who is 3 going on 33…trying to tell the time and her enquiring mind is always putting things together and if something is out-of-place she will tell you. A note to self is: try not assist her too much! I get told, no daddy I can do it myself. Carter is starting to say more words rather than the animal sounds, and as ever he is into everything but thank goodness that our Good Lord gave me a son to try to deal with these ladies. 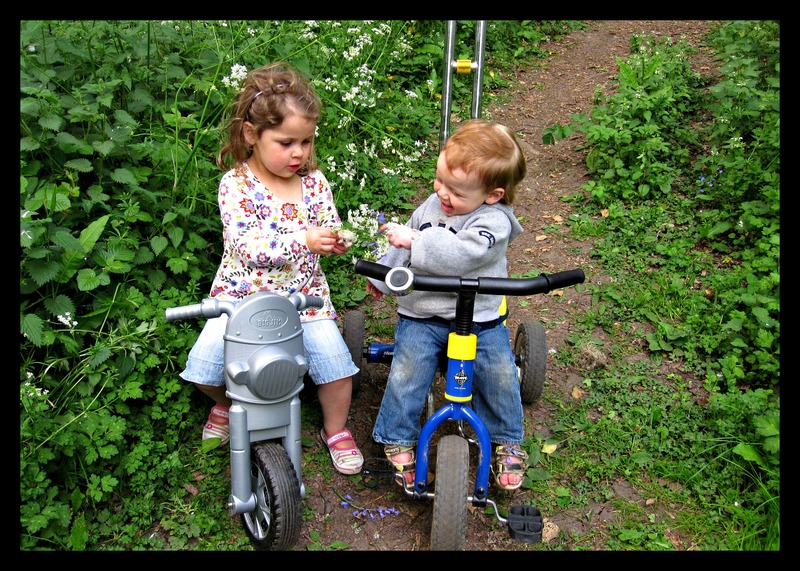 Our little Tamsin is now an army soldier and is commando crawling and Dodo has help in teaching her to wave and clap…. My oh my are we surprised at how quickly our little Tam Tam is picking up things. Kerry has started the crazy journey back to work to make our budget stretch a little more, it’s still a crazy time to see if it is all going to work out, so any extra prayers for that budget will be helpful. I think that’s about it for now, it’s certainly been a crazy last 48 hours but I will never forget it thanks to my beautiful wife!!! Loads of love to all that read this as you journey through this crazy time of the year. Trust all the planning and planning and planning is going ahead according to plan…you know what I mean, and if your loved one decides to go out for dinner and not tell you where you going and you going via another venue first……ask more questions as you might just get a surprise that you will never forget. Chow and many blessings, remember the reason for the season.